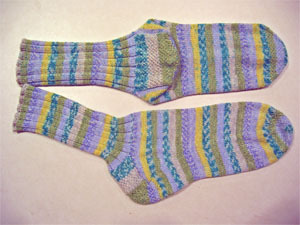 Here’s a pic of the finished socks for # 1 Son. I managed to get them washed and blocked last night. 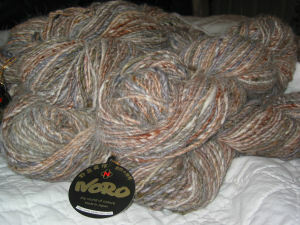 I managed to get six of the seven hanks of Noro Kochoran wound into balls last night. Two of the hanks had no knots in them, and the other four had one knot apiece. Not too bad. Since I don’t like surprises in the middle of my balls, I untied the knots and started a new ball. Most of the knots were toward the middle of the hank, but one was only a few yards in. That left me with a weird little ball that I guess I’ll use for my swatch. And, speaking of swatching, I hope to get that done tonight! For anyone who was wondering, #1 Son agreed that his fingerless gloves could wait. He’s not likely to need them for a few months and I can whip them out in a weekend or so. I promised him I wouldn’t forget. I’ve already got the yarn! OK. I’ll admit it. I’m a Lost addict. So of course I skipped the finale of American Idol in favor of the Lost season ender. It’s going to be a long time ’til fall. I should have known something was up when I could barely keep my eyes open during Revenge Of The Sith. Granted, it wasn’t the best movie ever, and it was late at night. But on the way home I was so exhausted I wouldn’t have been safe to drive. Sunday found me still in bed when K called at 10:00 AM. That’s way, way later than I usually get up. And I was in bed by 11:00 PM, exhausted. Thinking it was just the usual problem, I downed handfuls of Advil. But it didn’t help. Monday I had no breakfast. I bought lunch, but couldn’t eat it. By the time I left work, I was freezing cold and felt shaky. I forced myself to eat dinner, on the theory that would make me feel better. haha. I spent all Monday night regretting that decision. And the last two days I’ve spent in bed. Today I feel better. The fever is gone and I’ve been able to eat. And… no fair! I’ve had enough icky things strike me this year. I have managed to get a little knitting done, in between naps. I’ve turned the heels on #1 Son’s socks and I’m about 2 inches up the ankles. I want to get the socks and his fingerless gloves finished because I have another sock project I’d like to try out. And then I’d really like to tackle something a bit bigger. 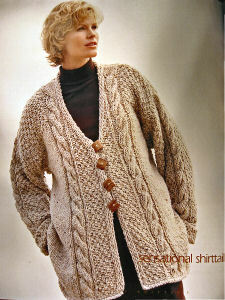 If I start a cardigan in June, I might be able to finish it by the time the cold weather sets in again. Maybe.